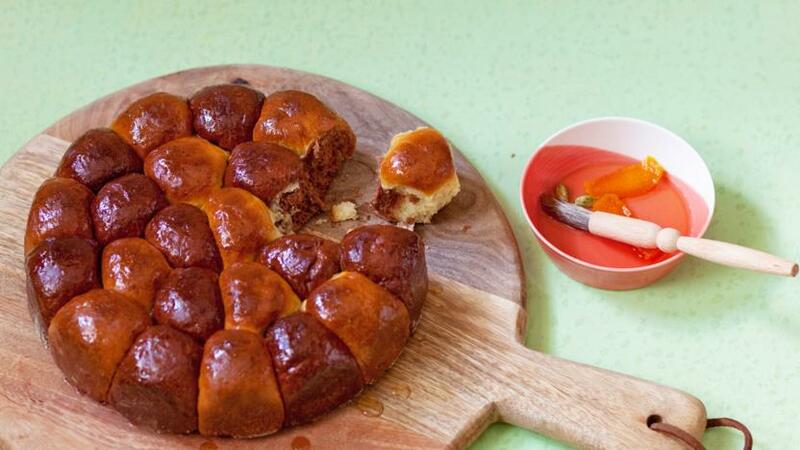 Chocolate and orange flavoured rolls are arranged in a pretty tear-and-share – serve warm while the chocolate filling is still melted and oozy. For this recipe you will need a 25cm/10in round, a deep-sided springform tin and a freestanding mixer fitted with a dough hook. For the orange dough, put the flour in the bowl of a freestanding mixer fitted with a dough hook. Add the salt, yeast, sugar and zest. Mix on a slow speed. Alternatively, put these ingredients into a large mixing bowl and mix well to combine. Gently warm the milk, butter and cardamom until the butter is melted, then add to the dry mixture. Gradually add the egg, mixing for about 5 minutes until the dough is soft and smooth. Keep kneading the dough until it is smooth and elastic. Alternatively, knead the dough by hand inside a large bowl for 5—10 minutes, until smooth and elastic, the dough will be quite wet. Tip the dough into a lightly oiled bowl and cover with cling film. Place in a warm place for 1 hour, or until the dough has doubled in size and springs back when you press it. For the chocolate and vanilla dough, put the flour and cocoa powder in the bowl of a freestanding mixer fitted with a dough hook. Add the salt, yeast and sugar. Mix on a slow speed. Alternatively, put these ingredients into a large mixing bowl and mix well to combine. Gently warm the milk, butter and vanilla until the butter is melted, then add to the dry mixture. Gradually add the egg, mixing for about 5 minutes until the dough is soft and smooth. Keep kneading the dough until it is smooth and elastic. Alternatively, knead the dough by hand inside a large bowl for 5—10 minutes, until smooth and elastic. Tip the dough into a lightly oiled bowl and cover with cling film. Place in a warm place for 1 hour, or until the dough has doubled in size and springs back when you press it. Oil a 25cm/10in round deep-sided springform tin and dust the inside with semolina. Divide each type of dough into 12 equal portions. Flatten each portion into a disk approximately 8cm/3¼in in diameter and place two pieces of chocolate one on top of the other in the middle. Gather up the edges of the dough to form a sack and pinch together to seal. Gently roll the ball in your hands and then place in the tin with the sealed edge downwards. Roll the remaining dough in the same way, alternating balls of orange and chocolate dough in the tin. Start from the outside of the tin, where there will be 14 balls, then 8 in the middle, and 2 inside. Cover the tin with cling film and prove for 30-40 minutes in a warm place. Meanwhile, for the syrup. Put the caster sugar, 50ml/2fl oz water, orange peel and cardamom pods in a small sauce pan. Warm gently until the sugar dissolves then bring to the boil for 1 minute. Remove from the heat and set aside. Bake the loaf for 20 minutes, or until the top has browned. Remove from the tin and carefully place upside down on a baking tray lined with baking paper. Return to the oven for a further 10—12 minutes until baked through. Put the loaf the right-side up on a wire rack and leave to cool slightly before brushing with the syrup. Serve the bread warm while the chocolate filling is still oozy. You can make this bread by hand, but the dough is very wet so it's much easier to use a mixer.